Are you ready for Arkship Conquest? Gofal watched the water as it coursed over his outstretched fingers. The light danced on its shifting surface, throwing patterns over the low wall that marked the edge of the waterfall. The dark shadows of fish moved beneath the pool, flashes of orange and crimson that came into focus close to the surface, then dissolved into the vague canvas of deeper water. They weren’t real fish. Very few still existed now, and those that did were far too precious to populate a concourse such as this. They were bots, like him, artificial machines following their pre-programmed routines. Gofal was far more complex than his aquatic counterparts, comparable in many ways to the sophistication of a human, and in some respects, he exceeded the abilities of his homo sapiens creators. Gofal was no ordinary bot. He had grown beyond his original programming, improving himself beyond the dreams of his parents, as all children must. He turned his hand over, sensing the difference in temperature between the air and the water, wondering if the boy might find the courage to speak to him. He had been sitting on the opposite side of the waterfall for almost twenty minutes, watching Gofal when he thought he wasn’t looking. Slowly, he had reduced the distance between them, his courage growing. “Are you Gofal?” the boy asked eventually. Gofal looked up from the water, trying to appear surprised to see the boy standing next to him now. His chubby face lit up. This seemed reasonable to him. “Otto,” he replied. Gofal knew already. The population of Icarus was under thirty thousand, so isolating one boy of his age – Gofal guessed he was ten – and cross referencing his features with those on the station’s records was a simple task. Sometimes life as an author is hard, not physically but mentally hard. It can feel like you’re in a weird version of Groundhog Day where you never get to the end. Write, eat, sleep, repeat! So the last few days have been a very pleasant change. It’s a holiday weekend here in the UK, and we’re basking in some glorious weather, so I’ve taken to writing in the garden rather than in my little home office. It’s made a drastic difference! I’ve got loads more words written, and it’s been a much more enjoyable experience. I’ve even had time to go out on my bike for the first time this year! 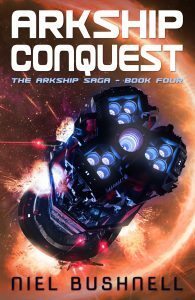 The upshot of all of this is that book 4, Arkship Conquest is almost finished, and I’m really pleased with how it’s coming together. I hope you’ve had an equally enjoyable weekend! And don’t forget you can save 25% on the launch price if you pre-order Arkship Conquest today.